"Winter should not be considered as only negation and destruction. It is a secret and inward working of powers, which in spring will burst into visible activity." Upon the arrival of almost 100 friendly volunteers from DC, Virginia, and Maryland(!) 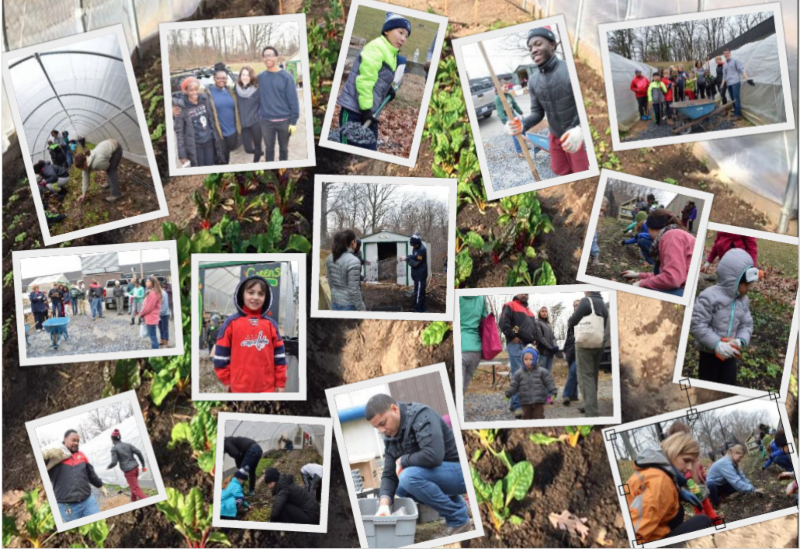 at our Fort Dupont Ice Arena Farm, located in Ward 7, we spent a day off as a day ON. Helping to literally move our mission forward, our volunteers moved loads of gravel and leaves, laid a path of gravel, moved & organized our tools, cleaned our beds, packaged worm castings, and moved and built shelves. We are incredibly touched by the support generated by wonderful individuals and families. DCUG can't thank our incredible volunteers enough! DC UrbanGreens has been featured in the Washington City Paper's article "In Wards 7 and 8, Feeding the Food Insecure is a Team Effort" as a nonprofit seeking to reach Wards 7 and 8 by selling our produce at low cost through our farm stands and delivery program. Highlighted in the article are our partners like Centrolina, DC Central Kitchen, sweetgreen and Good Food Markets who help us achieve our mission to alleviate Southeast DC's food insecurity. to create more opportunities to engage in growing veggies, relationships and access to healthy food in Wards 7 and 8. Look forward to a calendar update on our website. We run an urban farm in Ward 7 another in Ward 8. Come visit!